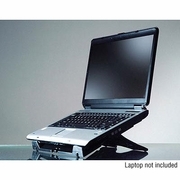 For 12" to 17" laptop computers, this adjustable laptop riser can improve the keyboard's working and viewing angle as well as help cool the computer's underside by improving circulation. The stand uses non-scratching rubber bumpers to keep your computer in place and can be adjusted to three preset angles. Laptop not included.